This spicy dark chocolate cake is redolent with sweet and fragrant Dutch speculaas spices. 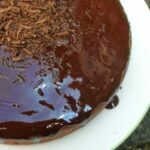 It’s glazed with a shiny dark chocolate ganache and the whole thing is egg and dairy free, making it inclusive and entirely suitable for vegans. What’s more, it’s incredibly easy to make. Our family, my mother’s side at least, used to be nicely contained within the boundaries of England and Scotland. As a child growing up, my holidays were usually spent visiting one or other of them and we were close. These days, the family has become international and live variously in Australia, Spain, California and Colombia. Needless to say, I don’t get to see them very often anymore. So I was delighted when a bunch of relies came down to visit us in Cornwall earlier this month. I was particularly pleased to see my vegan cousin from California who I haven’t met since his wedding five years ago. Of course I had to make him a cake. 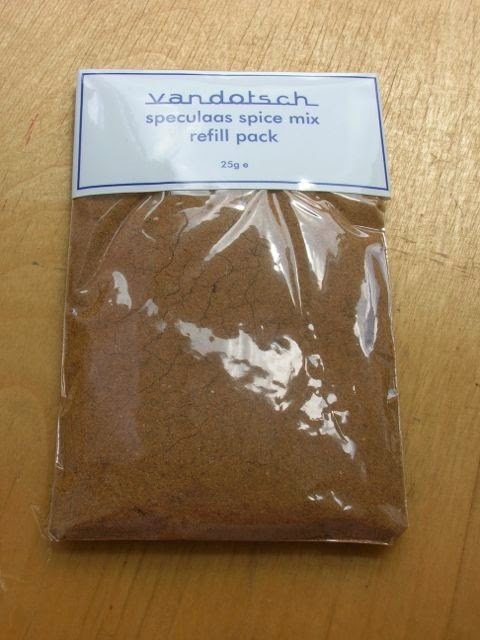 I’d recently been sent a special spice mix from the Speculaas Spice Company and I was keen to try it out. It’s based on the vanDotsch family’s secret recipe and only some of the spices are revealed in the ingredients. Speculaas is a Dutch spice mix dating from the 17th Century when Holland was sailing the Seven Seas in search of exotic spices. Today the spice mix has been mostly standardised and is best known for its use in speculaas biscuits. If you’ve had these in Belgium, you’ll know them as speculoos. This mix consists of nine spices including Sri Lankan cinnamon, cloves and ginger. The overwhelming aroma emanating from the opened packet was of cloves and cinnamon – a heady mix indeed. But other less obvious scents were there too. On trying the spice, we all had a go at guessing what the secret ingredients might be. My aunt was convinced it contained black pepper, CT was pretty sure nutmeg was in it and I thought I could taste allspice. It certainly has a hint of a kick to it and is full of flavour. The company tries to source its spices at as high a grade as possible and to ensure that they are pure with no additives of any kind. They are also mostly organic, fairtrade or both. 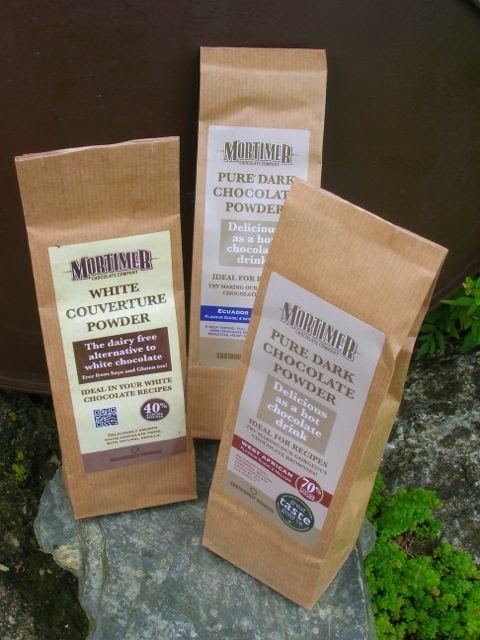 Over the past few weeks, I’ve been trying out some pure chocolate powders from the chocolate company Mortimer. These are not cocoa powder, but ground up chocolate. Well, what a very good idea I thought; no need to faff around melting chocolate and creating extra washing up for baking purposes now – the chocolate can be added directly into the mix. And this has proved to be the case. You wouldn’t know from eating the cakes I’ve made that the traditional method had not been used. 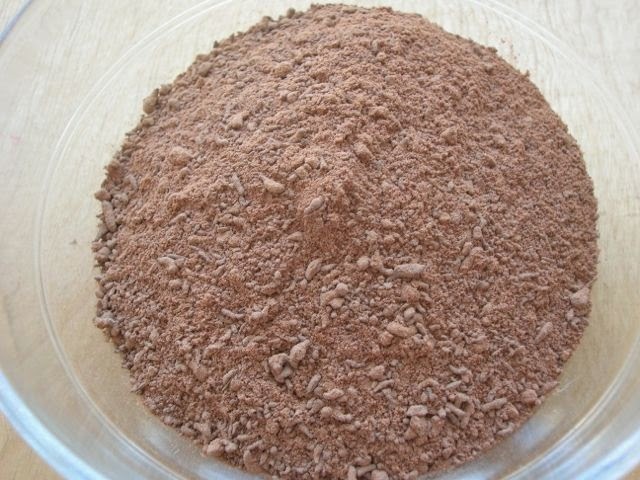 Finer than grated chocolate and similar to cocoa powder, it gets completely incorporated into the baking mix. I did try melting the white couverture powder in these burnt butter cupcakes and it melted almost instantaneously. In addition to the white couverture powder (40%), which smells deliciously vanillary, I also had two different 70% dark chocolate powders to try. All of the powders come in 220g packs and are suitable for drinking as hot chocolate as well as in baking recipes. Each packet has a recipe printed on the back; I want to make all of them, although the white chocolate coconut ice-cream sounds the most intriguing. Two continents, two colours, two tastes. To see what differences we could spot between the two dark chocolates, CT and I tried both, in powder form and as a hot chocolate. The powder melted into the hot milk really quickly, leaving no bits behind, as can sometimes be the case. They were different in colour with the Ecuador being slightly darker and redder. Both were quite delicious. For convenience, I reckon these are excellent products. They retail at £3.80 and are now available at Sainsburys. South America and Ghana versions are also available to buy online. Described as flavour 4 intense, this tastes less sweet than the West African, but surprisingly less bitter too. In hot chocolate form it was also less sweet as well as being more refreshing and robust. I have heard that Ecuador is the home of the best quality cacao and this is reflected, we think, in our perceptions here. The recipe suggestion was for sumptuous chocolate sauce. Described as flavour 2 mellow, we found this had a fruiter and sweeter smell and tasted slightly of cardamom. 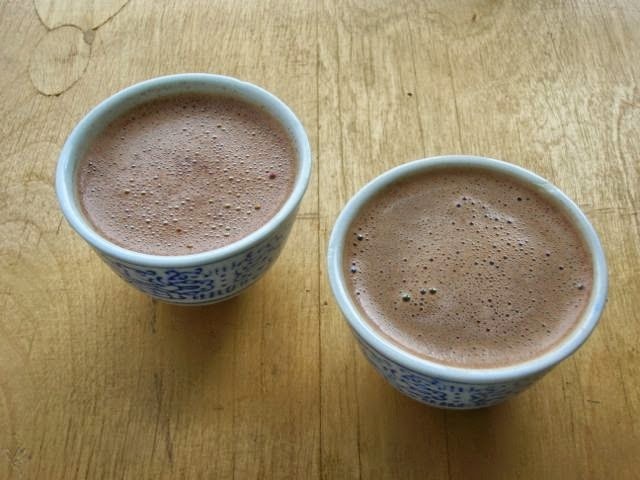 In hot chocolate form it also came across as fruity with notes of coconut and was slightly sweeter than the Ecuador. The recipe suggestion was for gorgeous chocolate brownies. 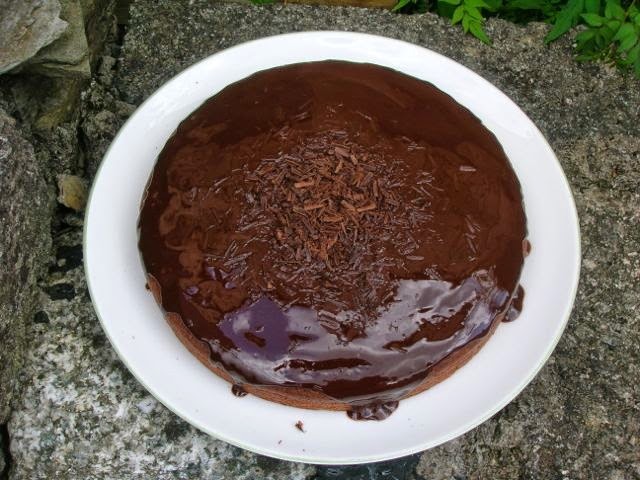 The method for preparing this vegan spicy dark chocolate cake is an easy one. No need to cream hard butter and sugar. Thanks to the wonderful chocolate powder, it’s pretty much a case of adding the wet ingredients to the dry ones and stirring. 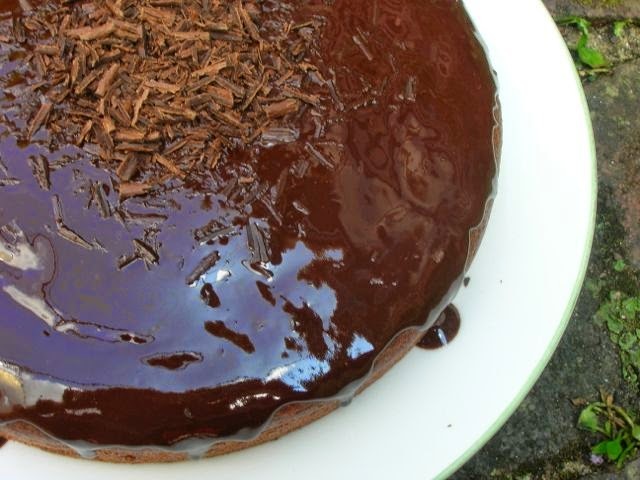 The shiny dark chocolate glaze is even easier to make. Everyone enjoyed the cake and my cousin was delighted with his welcome back vegan bake. We all thought it was strong on flavour and not too sweet – the way things should be. 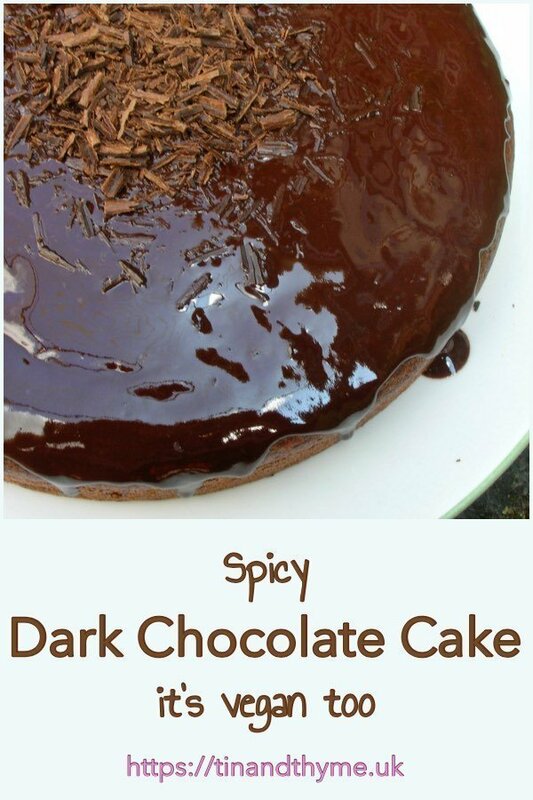 A well flavoured spicy chocolate cake with a dark chocolate glaze. Simple to make, it produces a nice textured crumb which isn't too sweet. Sift the dry ingredients into a bowl. Stir in the chocolate and make a well in the centre. Mash the banana up with the sugar, then beat in the oil. Pour gradually into the dry ingredients, mixing from the centre outwards. Add the water and vinegar and mix until just incorporated. Scrape into a 21cm round cake mould or lined tin and bake at 180℃, 350℉, Gas 4 for 40 minutes. Remove from the oven, allow to cool for a ten minutes, then turn out onto a wire rack to cool completely. Melt the coconut and chocolate in a pan over a low heat. Remove from the heat and stir in the maple syrup until smooth. Pour over the cake, allowing it to drip down the sides. Scatter over some grated dark chocolate if desired. This will give 8-10 slices, depending on how big you cut them. Spicy Dark Chocolate Cake. PIN IT. I love speculaas! I’m Dutch, so I really like recipes like this. I can imagine you miss your family when they are all so far away. Then the time you can spend together is extra precious! Oh I didn’t know you were Dutch LL, that’s interesting. Do you have your own secret family recipe by any chance? It seems that family living all over the place is the modern way. This sounds like a really interesting cake and one I would have been over the moon to receive if I was a visiting relative! The cake sounds delicious and the icing looks divine…… I love the shine! Love the use of coconut oil. The chocolate powder is a great idea and sounds incredibly versatile…. Must have a look next time I’m in Waitrose. Thanks Kate. I think it’s the coconut oil that gives it such a nice shine – makes it taste good too. The chocolate powder really makes life a lot easier. I’ve just used some in my baking today. Dear Kate, our Chocolate powders are available in Sainsbury’s and unfortunately no longer in Waitrose. Sorry my fault for not updating our website. Many thanks for letting me know. That’s really helpful. I will keep my eye out in Sainsbury’s instead! I just made some biscuits with speculaas too! I really love this spice. So aromatic and addictive; it must be wonderful in your super chocolatey cake! Thanks Alida. Speculaas biscuits are delicious. I’ve never made my own, but it’s on my list. I haven’t heard of that mix before, but it sounds delicious, especially in a chocolate cake! Thank you. If you ever go to Holland, you won’t be able to avoid it, but the biscuits are sold here in the UK too. This sounds a great use for this delicious spice mix – I can imagine the smell as it was cooking! Thanks Suelle, it did indeed scent the house delightfully . This sounds amazing. Do you think this would work with gluten free flour as well? The chocolate cake looks heavenly, Choclette. I love speculaas spice mix and tend to buy a lot of them during X’mas season. Thanks Angie. You’re right, it does tend to be something I normally associate with Christmas. It’s interesting how things have moved on just in the last couple of years with vegan cakes. Recipes were quite hard to find when I made my first specific vegan cake a few years ago, now there are so many good ideas. Thanks CC, it’s fun to see how it’s being used. That cake looks wicked Choclette, I must make it for Graham, he’ll love it! Loving the sound of those chocolate powders too. Great idea. Thanks Charlene, it did taste rather good. This sounds delicious, I will book mark the recipe and add spelt flour to my shopping list. Thanks Nayna. Spelt flour isn’t strictly necessary, but it is more benign on our digestive system than regular wheat flours. That is one seriously decadent looking cake!!!!! Thanks Aunt Bee, but it’s not too naughty really! that does look delicious. Mind you, anything with chocolate!!! Thanks Fiona, chocolate has a habit of being just too good. Thank you. We all really liked it, but if you like your cakes sweet there are many others on the blog that might suit you better. I am Vegan and this cake looks so delicious! really tempted to make it! Thanks Melissa. Let me know how it turns out if you do give it a go.